Justin Lanman, an assistant principal at Miami Trace Elementary School, greeted students as they got off the buses Wednesday morning. Miami Trace Elementary school students looked excited to begin a new school year Wednesday. Bell Aire Intermediate School fifth graders are ready to start a new year. 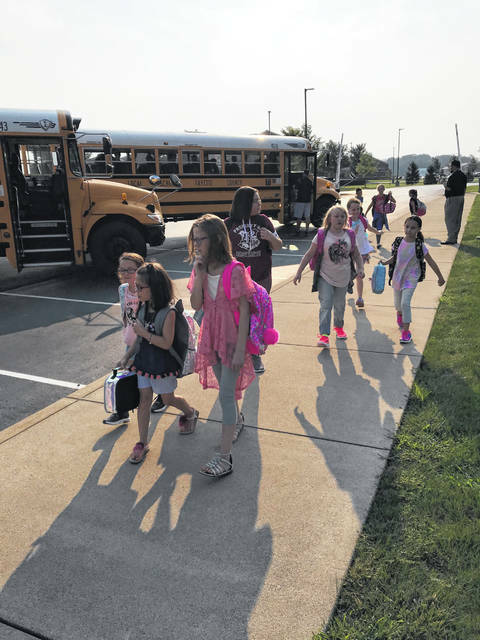 As they departed the buses Wednesday morning, students made the short walk into Miami Trace Elementary School for another year. 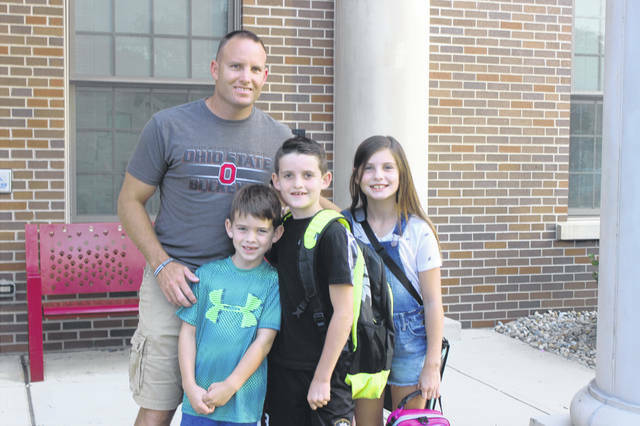 Matt Pfeifer walks with his children Maggie, fifth grade, and Sam, third grade, into Bell Aire Intermediate School for their first day of classes. Also pictured is Max, who will be in the first grade this year. Bell Aire Intermediate School fourth graders, Lennon and Jeffrey, start the school day. 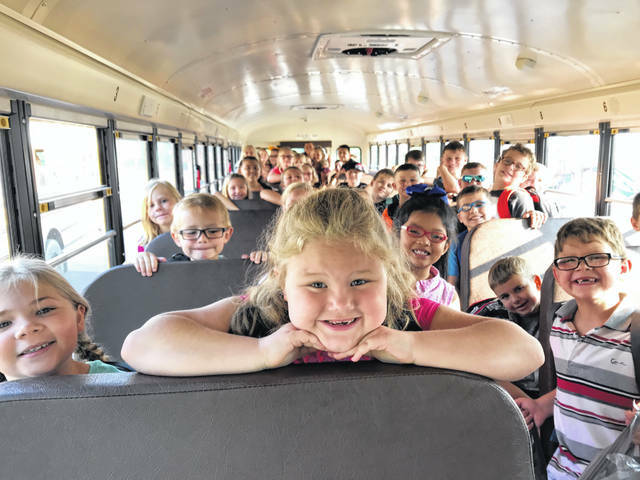 Just before getting off their bus Wednesday, these Miami Trace Elementary students posed for the camera as they set off to embark on a new school year. 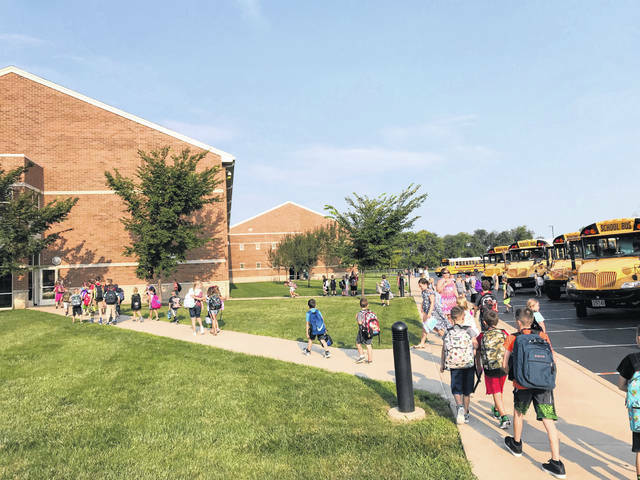 Nothing marks the end of summer quite like the sound of school bells and school buses, which was the exact chorus heard around the community Wednesday as Miami Trace Local Schools and Washington Court House City Schools (WCHCS) started classes for the 2018-19 school year. 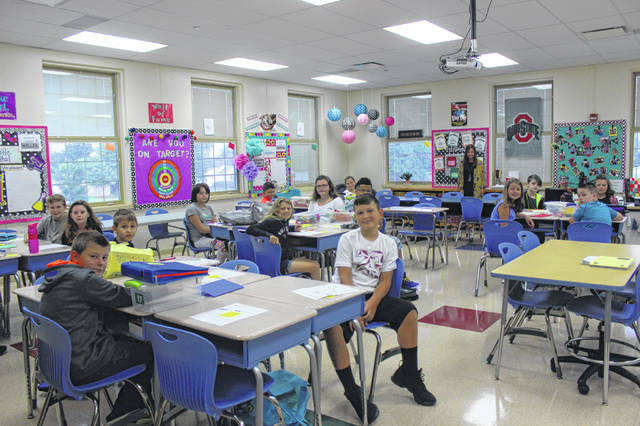 Students in most grades and schools for WCHCS resumed their education Wednesday — with the exception of Cherry Hill Primary School — with an excitable return, according to Tom Bailey, WCHCS Superintendent in his second year. Bailey said depending on the inquiry, parents with questions about scheduling, classes or a particular building should contact the school the child will be attending directly (such as the high school or Belle Aire Intermediate). Questions about the transportation department, food services, enrollment procedure, registration of students or other similar inquiries can be directed to the central office. 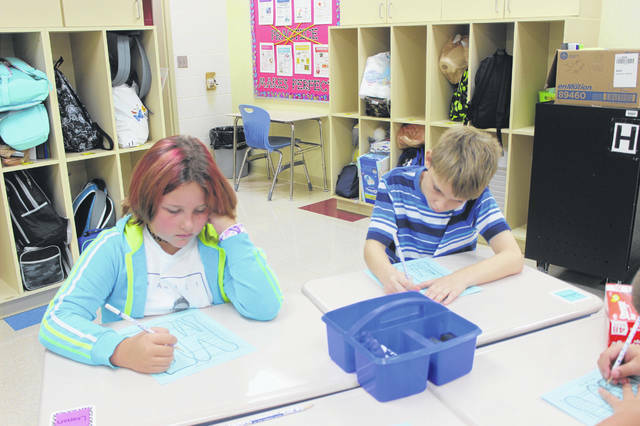 Miami Trace Local Schools also got off to a great start Wednesday at the centralized campus. It’s a time of transition for the district as high school students will move into a brand-new high school — currently under construction — in January. The new school is located on a nearly 60-acre piece of farmland to the east of the football stadium. The new structure will replace the existing high school that opened in 1962. Lewis said he visited the high school, middle school and elementary school Wednesday. Lewis added that the high school students seem prepared for the mid-year move into the new building.